A silvery light, pure enough to carry a hallmark, was beginning to darken as a rogue wind ploughed furrows across the Sound of Mull; an unmistakably Scottish backdrop for the small, sturdy ship before us. The muted lights beckoned to a cosy interior with well-polished silver and gleaming crystal as the smart platoon of passengers crossed the gangway to the strains of a bagpiper. 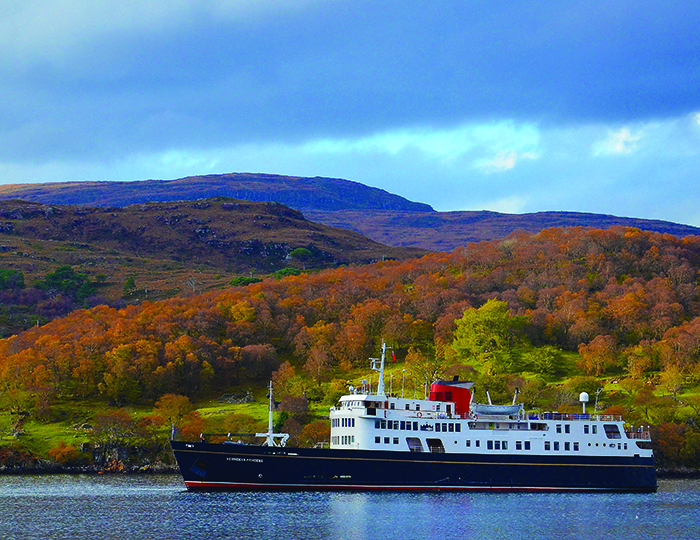 Purpose-built in 1964 as MV Columba to transport 600 passengers on regular sailings to Scotland’s Western Isles, Hebridean Princess was lovingly and extensively reconstructed then relaunched in 1989, but still seems to belong to another age, when travel was a more elegant affair. 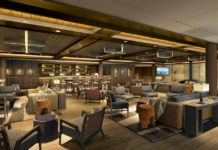 As we sailed from the Victorian fishing town of Oban and headed into the burnished silver night, I began to find my way around this curious amalgamation of snug hotel and luxury cruise ship. Reminiscent of a well-appointed country lodge, the interiors boast evocative watercolours and polished brass clocks, with an Inglenook fireplace surmounted by a timber cross beam and varnished teak decks festooned with hanging baskets brimful with geraniums and petunias. 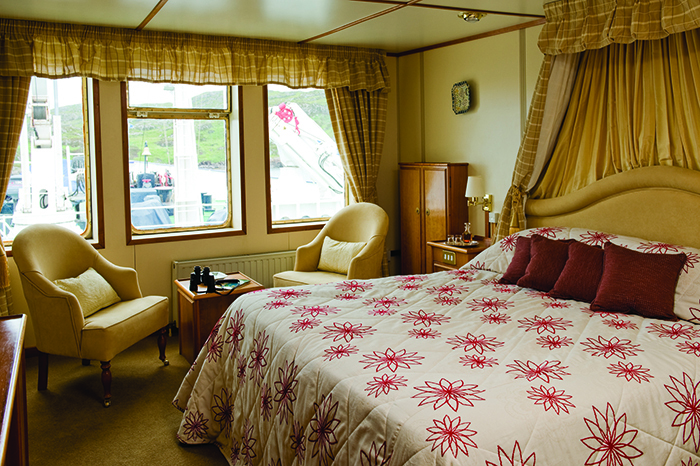 There are 20 richly decorated, boutique hotel-style twin and double cabins as well as 10 comfortable single cabins. A more contemporary palette of textures and colour is being slowly introduced, which is urbane and organic. I wake to a watery tableau of white horses tufting the Firth of Lorne created by the remnants of Hurricane Hermine that was packing a punch with squally winds howling in from the Atlantic. This four-night Argyll’s Atlantic Islands cruise in early September ticked all the right boxes on my wish list but I was now beginning to think the title of this voyage had deserved more scrutiny. Having spent several childhood holidays on Scotland’s western coast, I should have realised that such an evocative tag has caveats – namely the vicissitudes of the Scottish weather. 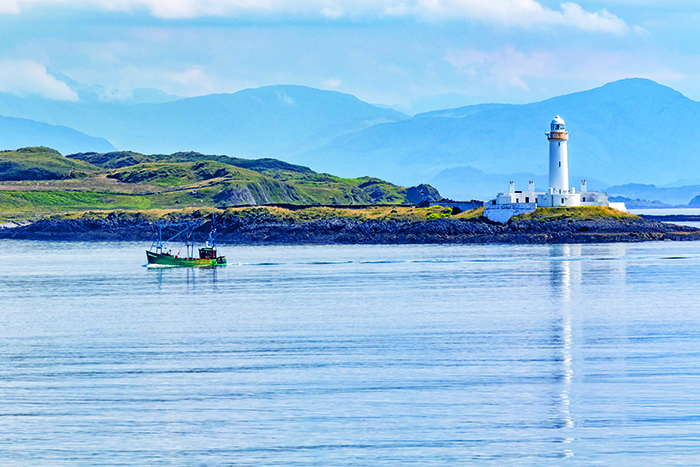 In light of the sea conditions, Captain Richard Heaton reluctantly took the decision to amend our itinerary and the compass was set for Colonsay, two hours away. This self-styled ‘Jewel of the Hebrides’ is just 10 miles long and two miles wide. I traded the pitching ship and hitched a ride on a mini-bus along heather-clad tracks to Colonsay House Gardens, renowned for its fine collection of rhododendrons. The easterly passage to Craobh Haven that afternoon was more pleasant as the winds were on our stern. Having worked up an appetite, I tackled the fresh langoustines with gusto. These crustaceans were delivered directly from a fishing boat the previous evening and were delicious when savoured with a glass or two of crisp Sancerre Blanc Domaine Pierre Martin 2014. The Columba Restaurant has plenty of tables for two as well as one reserved for the convoy of lively widows who relish being hosted by a senior officer. Being so impressed with the creative menus, I found time to chat with Chef de Cuisine, Paul Sim. A modest man from Ledbury in Herefordshire, Paul told me that he’s been in the job for 13 years. He explained that the onboard menus are written daily depending on the availability of fresh produce, such as scallops from Orkney, halibut and salmon from their preferred supplier in Glasgow along with Tweed Valley beef and Borders lamb. Scottish cheeses and seasonal berries compete for praise with passengers, many of whom Paul knows well as they have sailed many times before. The phenomenal repeat factor of this cruise line soon became evident; the other passengers exuded an evangelistic zeal for ‘their’ ship and certainly wouldn’t let a pesky Force 6 wind spoil their daily activities. Their admiration for the personable crew of 38 who anticipate guests’ preferences with unerring instinct was unrequited. 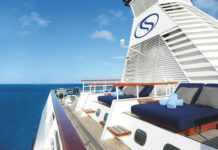 I was beginning to see why the world’s smallest luxury cruise ship has gained such an enviable reputation for offering a harmonious, all-inclusive experience. One repeater has bestowed her seal of approval like no other. 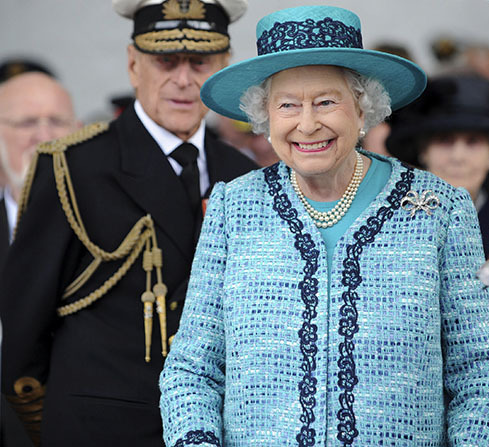 When Her Majesty The Queen chartered Hebridean Princess for her 80th birthday in the summer of 2006, she enjoyed it so much another charter was arranged in July 2010 to celebrate the 60th birthday of the Princess Royal. I had always assumed that the top-of-the-range Arran Suite would be the billet favoured by the Monarch, but during my recent sojourn I gleaned from a member of the housekeeping team that Her Majesty preferred the delightful Isle of Bute cabin with a private balcony overlooking the Skye Deck, while The Duke of Edinburgh took up residence in Isle of Berneray – an identical cabin on the starboard side. The following morning the royal connection was evoked once again. The wind abated sufficiently to allow a comfortable passage to Islay. Located at the head of Loch Laphroaig on the south coast of Islay, the Laphroaig Distillery has been renowned for more than two centuries for the rich, unmistakable taste of its whisky, which we were reliably informed is a favourite of the Prince of Wales. After a tour of the kilns and stills we nosed the unique ‘peaty’ aromas before quaffing a dram of the umber nectar. oyster-catcher. Rounding the Sound of Mull, our knowledgeable guide Marilyn Hunter pointed out Duart Castle, the medieval stronghold of the chiefs of Clan MacLean which lies in the shadow of Dun da Ghaoithe (Hill of the Two Winds). The irony wasn’t lost on me, but my faith in Scottish weather was restored as I glimpsed the colourful houses bathed in the butterscotch light of early autumn and mirrored in Tobermory’s picturesque harbour, where the unruffled surface was as serene as my time on board Hebridean Princess. 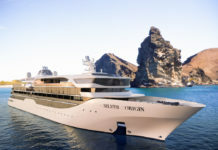 GETTING THERE: Hebridean Island Cruises offers voyages around Scotland’s Western Isles from £2,460pp (based on two people sharing). A four-night Hebridean Tapestry cruise round-trip from Oban visiting Jura, Iona and Ulva departs on 25 August 2017. Price includes all meals, drinks, excursions, gratuities, taxes, internet and transport from Glasgow or Inverness or free parking. For more info, visit hebridean.co.uk or call 01756 704 700.